On Nov. 15, representatives from Pizza Hut® delivered something other than pizza for the patients at Akron Children’s Hospital. 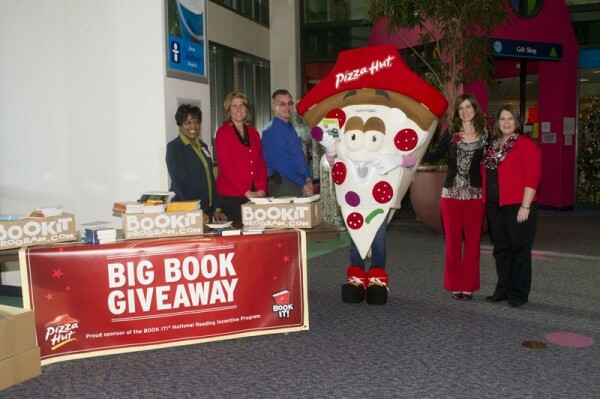 At both the Akron and Mahoning Valley campuses, Akron Children’s hosted a BOOK IT!® Big Book Giveaway where Hallrich Inc., Pizza Hut’s local franchisee, donated 500 books to children at the hospital. The books will be given to patients receiving care at Akron Children’s, as well as distributed through the hospital’s Reach Out and Read® program, which supports the development of early literacy skills among children as a standard part of pediatric primary care. “Pizza Hut has long been a champion of services and programs that benefit the community. Its national Book It reading program nurtures the minds of children and fosters a love of reading,” said John Zolio, executive director of the Akron Children’s Hospital Foundation. In addition to books, Pizza Hut brought along their life-sized pizza slice mascot who charmed children and adults alike. Thanks to Pizza Hut for their generous donation.